Google’s YouTube BoxOffice (http://www.youtube.com/BoxOffice) is an ad supported channel on the video sharing website that showcases a blockbuster movie every month. 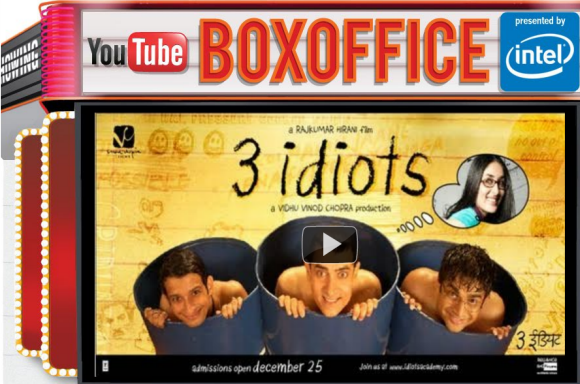 This month’s blockbuster movie is Amir Khan’s 3 Idiots. I just finished watching the thought provoking Bollywood entertainer, 3 Idiots, on YouTube and the movie experience is very nice. Unlike television channels that keep bombarding us with multiple advertisements every 15 minutes, YouTube BoxOffice has very few advertisement breaks. Each advertisement break interrupts the movie for couple of seconds with a single ad and resumes the entertainment quickly. I thoroughly enjoyed watching the movie and I’ll be waiting for next month’s blockbuster showcase on YouTube BoxOffice. Thank you Google for bringing Bollywood to YouTube.